"Rabbit Farm – Fast and Efficient Way to Generate Sustainable Income"
Nepal has one of the lowest Purchasing Power Parity (PPP) indexes in the world. In 2016, South Korea ranked 49th in the world with a PPP of $35,790, while Nepal ranked 187th with $2,520*. Rabbit farming has been proven to be one of the best strategies to address the country’s food insecurity problem, offering employment to youth, controlling foreign migration, and reducing the dependency on meat imports by offering a healthy meat option. Because of the minimal investment of money and time required to setup the farm, and the potential to utilize local resources, rabbit farming is very promising. Nowadays, the agriculture sector is one of the most important sectors in the Nepalese economy. The devastating earthquake in 2015 caused much damage to the existing agricultural infrastructure. Consequently, low agricultural productivity is a challenge in Nepal. Farming & manufacturing farming products are highly promoted by the Nepalese government. In addition, farmers in Nepal face many other challenges including high production costs and low access to technology and finance. The Himalayan Rabbit Farm(HRF) was started in 2012 as the first commercial rabbit farm in Nepal. The farmers have been trained in rabbit production focusing on utilizing locally available resources such as hutch construction and utilization of barren lands for forage production for feeding rabbits. In result, HRF provided quality training to more than 500 farmers from 11 districts of Nepal and contributed to establish more than 300 small-scale rabbit production units. *For more information about the economic situation in Nepal, please refer to the Global Business Knowledge website. The Himalayan Rabbit Farm (HRF) started with 25 does (female rabbits) which established farm of 600 doe capacity farms including its farm and the farmers they trained. Moreover, more than 80% of their Currently, they are supplying to 20 clients (restaurants, hotels and meat shops). 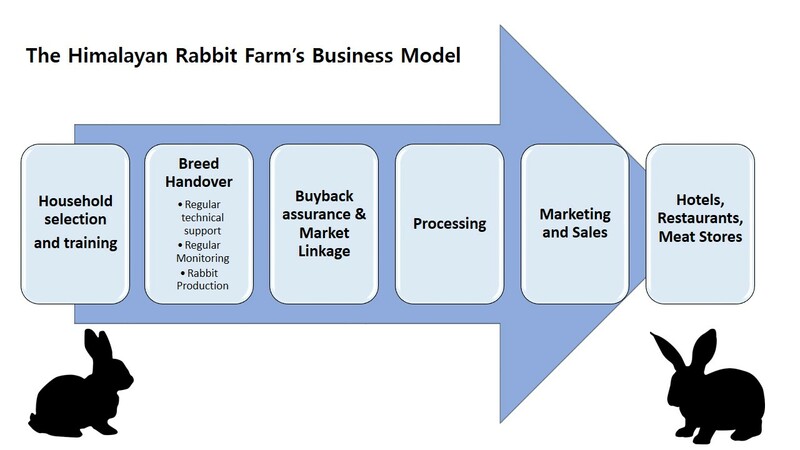 Regarding to the market potential, the rabbit meat is being sold in the local markets in the areas they have trained and supported. With the increase in demand for rabbit breeds by the aspiring rabbit farmers from different parts of Nepal and demand for rabbit meat by many eateries, there is a great opportunity in this sector. With the funds raised through The Bridge’s crowd funding platform, HRF can establish a standardized breeding center, which is very important to upgrade the quality of the breeds produced in different areas of Nepal. Moreover, investment (Impact Donation) in the hutches will help to increase its capacity to produce and distribute rabbits more widely. The installation of a vacuum pack machine at the farm will help to do the branding of our product, reducing the cost and hurdles of transporting the rabbits toother places for processing. For the training and monitoring, HRF will regularly visit 10 ~ 15 existing medium scale rabbit farms to check the performance of their farm and train and suggest the best method. The Himalayan Rabbit Farm Offers Multiple Income-Earning Opportunities For Vulnerable Women By Operating Rabbit Farm. Share The Opportunities For Self-Reliance! 토끼농장 지원으로 네팔의 빈곤층의 자립에 함께 해주세요! 제가 이 세상에 태어나 군가에게 희망과 용기를 주면 뜻 깊은 삶이었고 할 수 있을 것입니다. 어둠 속의 촛불 하나가 되어 다른 촛불들에 불을 밝힐 수 있다면 좋겠습니다. 제 생일에 여러분도 저와 같이 초를 켜서 네팔에 있는 가정들이 초를 밝힐 수 있게 함께 해주세요. 제 삶에서 잊지 못할 생일 선물이 될 것입니다. I initiated commercial rabbit farming for meat purpose for the first time in Nepal in 2012. We have been providing training, regular monitoring and supervision at their field and are assuring the buy back of rabbits produced to ensure regular source of nutrition and income to the low-income families in different areas. To scale up this support, we have realized the importance of a model demonstration farm that will act as a training center to provide them with hands-on practical experiences so as to initiate and sustain the rabbit farm. The farmers will learn about housing, feeding by using the local resources, management, sanitation and hygiene aspects that are very important for them to succeed in rabbit farming. This demonstration center will help them to establish and operate a farm with minimum investment and provide them with updated knowledge, quality breeds. The families can run and become a model farmer at their place by replicating the model.